The planet of Uranus often breaks with the tradition and blood ties are not as important, in the sense that the family of origin could involve a step family, members living apart, or something unconventional in the background. It can often indicate an individual that chooses a different home base, it could be viewed as non-conforming, but the person changes their attitudes towards home on a regular basis, and it could involve lots of interesting people visiting, social gatherings, occult learning, groups with the same ideals, anything dealing with information, astrology, and science. The person can sometimes get impatient and bored with the same routine, and new experience is craved. The person may experience many substantial ups and downs in the personal sphere, and it could be a place Uranus applies its experimental attitude to anything new with a strong urge to change and there is need for inner progress to be made with this placement. The individual is not to be enslaved by the past, or inhibited the type is forging a new image of family life, sometimes this may be shocking to those close, but it is only by turning things over that the person can lead the home life that is desired. Uranus can sometimes take revolt from their base, revolting from their foundations with revolution occurring in the private life. Those with Uranus in the 4th house could change residence quite frequently, but the individual could remain at the same address for a longer period, especially when the home life is unusual, their decoration and furniture rearranged often. The chosen career of the individual or that of a family member may influence these sudden moves and be a factor as to why things never get too familiar, as they are forced to adapt to new environments more than the average person. The décor could be bizarre, futuristic, with different tastes. The home could be filled with the latest technology, and new age gadgets. The childhood home and family life may have been quite unusual in some way, and the parent could have been quite creative, original, or erratic sometimes unstable and unreliable. Also emotional comfort may have been lacking, and the father may be aloof or inaccessible to the child growing up with this placement, having difficulty in showing personal and physical affection. Uranus in the 4th house can show someone at odds with heir social, ethnic, and economic background. The father may have appeared to be unemotional, distanced, or expected nothing short of creative brilliance, perfection, setting high ideals. The parenting may have been inconsistent. Uranus comes with no strings attached, and with the archetype of the Uranus symbol when placed in the 4th house it isn’t the most nurturing caring and protective, and will tend to resist any obligations. In order to shake things up, the area of family is one where the individual may decide to go their own way, separating from the family, deviating from the normal path, and not doing what is expected. All of this could be interpreted as family disobedience, and going against the grain, breaking family tradition, rules, and ancestry, turning their back on their kinfolk, accompanying a familiar feeling of rejection. One with this position of Uranus is drastically altering the landscape and it is an indicator of the broken family. The strongest urge is not to be dependent on their familial roots. An intense desire for freedom from the past is felt, and adverse response to conditioning. Where Uranus is placed in the astrological chart is where we want to take full control of our own destiny. A feeling of restlessness and the need for space is present. Also the individual needs to feel a sense of freedom at home, a feeling of no obligations, and often creating a distanced relationship with one’s early roots. Uranus here may be an indicator of divorce of the parents, suggesting unease in ever feeling settled, with the unnerving sense that something is about to happen to ruffle the nest. 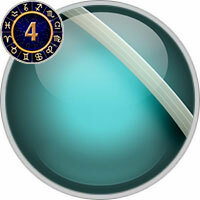 Often Uranus in the 4th house has carried feelings of not belonging, and home may feel more like an alien environment. Often feeling like outsiders, strangers and outcasts from their place of origin. The type is seen to rebel against tradition, social norms, and the expectations of the parents. A powerful sense of being uprooted, and there may have been some disruption in the early part of life, and this could be one that has created much anxiety. The person may experience plenty of upheaval on the domestic scene, chaos in the family home, and sometimes these things are not necessarily chosen, but something outside conspires and these events happen to the individual, upsetting the home itself. The person needs to possess an image of being independent, and different at home, and Uranus placed in this position never gets in ruts or stuck in routine. Uranus here has been linked with the wanderer, the emigrant, one who wants to break-free from their place of origin. It tends to shatter foundations, and there is also a sense of liberality in this sphere they are not dominated by norms and are free to set-up home, however the person chooses. The person may not be able to choose the disrupting circumstances that sway the boat of their inner-emotional anchoring and ability to feel at home in the normal sense. Still, there is an open door policy at home, one that welcomes all types, because the individual is not the clannish type, and one doesn’t need a birth right to determine where they belong. Uranus in the fourth house may alter your nurturing style significantly. You seek unusual ways to express your desires in this arena that sets you apart from most. The concept of nurturing doesn’t come naturally to you. Your independent streak might make you want to run away from nurturing when it’s proffered to you. As a nurturer, you can be very loving and caring. But sometimes you withdraw and prefer aloofness. To others you may appear erratic but there’s nothing wrong with your intentions. At heart you always have the best of intentions. Uranus in the fourth may indicate the style of nurturing or "mothering" that you yourself have received as a child. You may remember your childhood as adequate in material areas but somewhat lacking in emotional support.